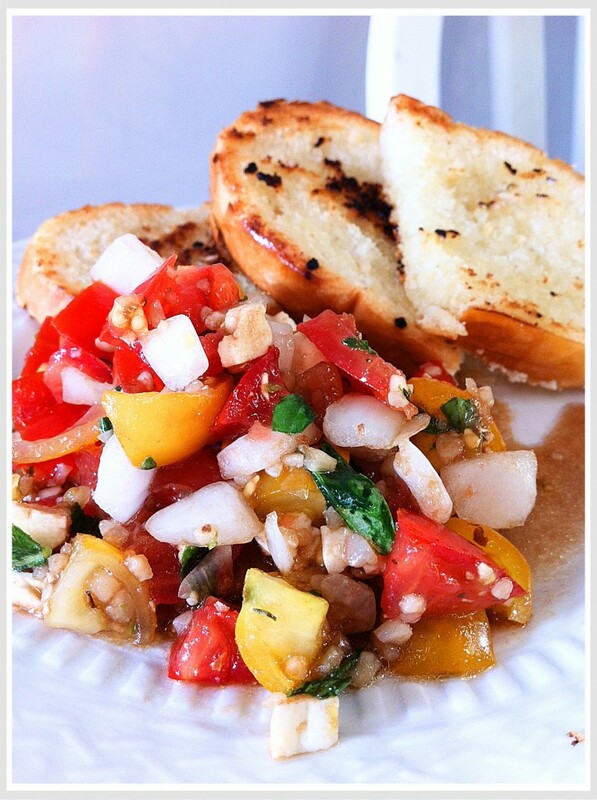 I love bruschetta! My favourite was actually in a food court, served by one of those Italian kiosks with the pasta and breads. The bruschetta there was pungent, to say the least. So garlic’y it almost burned, but oh so good! For the olive oil and balsamic vinegar, its more of a to taste thing. Actually the whole combination is. If you don’t like a ton of garlic, just a kiss of it, don’t add as much. Don’t like the sharp tang of balsamic, just add a drizzle. If you don’t have fresh basil, dried works just fine! Chop the tomatoes, basil, feta, and onion and place into a bowl, add garlic. Drizzle with olive oil and balsamic vinegar to taste. Serve with slices of baguette that have been toasted or grilled in garlic butter. Mix a bit ahead of time, this way it lets the flavours meld.